Real property conveyances are governed by Chapter 565 of the Michigan Legislature, but grant deeds are not statutory forms in Michigan. 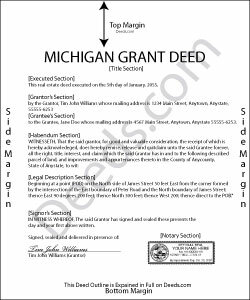 Grant deeds convey property from the grantor (generally the owner) to the grantee (generally the purchaser), with the guarantee that the grantor has not previously sold the real property interest being conveyed to the grantee, and that the property is without any liens or encumbrances, except for those specified in the deed. Compared to a statutory warranty deed, grant deeds offer less protection to the grantee as they do not require the grantor to defend the title claims. However, they still offer more protection than a statutory quitclaim deed, guaranteeing that the owner does have a valid ownership interest in the property. In addition to meeting all state and local standards for recorded documents, a lawful deed must include the grantor's full name and marital status, as well as the grantee's name, marital status, address, and vesting (MCL 565.201). Vesting describes how the grantee holds title to the property. For Michigan residential property, the primary methods for holding title are tenancy in common, joint tenancy, and tenancy by the entirety. A grant of ownership of real estate to two or more unmarried persons is presumed to create a tenancy in common unless a joint tenancy is declared. Transfers to a married couple create a tenancy by the entirety (MCL 554.43-45). As with any conveyance of real estate, a grant deed requires a complete legal description of the parcel, the source of title, and a statement of the full consideration given for the transaction. If the consideration reported is nominal or not disclosed, file a Real Estate Transfer Tax Valuation Affidavit (form 2705) with the local Register of Deeds. This is important, as the value of the transfer must be known in order to calculate transfer tax (MCL 207.525). In all cases where real estate is transferred, file a Property Transfer Affidavit (form 2766) to ensure correct assessment for tax purposes. The new owner must file in the municipality where the property is located within 45 days of transfer (MCL 207.504, 207.525). In Michigan, a deed cannot be recorded unless it has been acknowledged (MCL 565.47). Recording preserves a clear chain of title for the property and provides public notice of the transfer. This protects both the grantor and the grantee from claims based on inaccurate information. Any deed executed within the state must be acknowledged before a judge, clerk of a court of record, or a notary public of the same state (MCL 565.8). If the deed is executed in another state, it may be acknowledged according to the laws of that state (MCL 565.9). This article is provided for informational purposes only and is not a substitute for legal advice. Contact a lawyer with questions about grant deeds or for any other issues related to transfers of real property in Michigan.